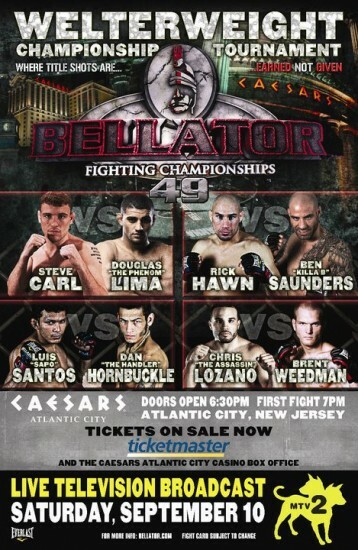 It’s almost fall and Bellator’s fifth season is upon us. I really missed the promotion as the summer series wasn’t enough to satiate me, especially given the postponement of Joe Warren’s featherweight title fight with Patricio Freire. But now it’s time for the season five welterweight tournament which features a number of familiar faces. Dan Hornbuckle, Ben Saunders, Brent Weedman, and Chris Lozano have all returned to compete in this tournament. Rick Hawn was scheduled to participate, but unfortunate, was forced to pull out due to injury. Still, this tournament looks to be a good one. Bellator 49 will be live on MTV2 at 9:00 PM EST/8:00 PM CST with a replay shown immediately after the broadcast. We’ve got a lot of other Bellator action, as MTV2 features a fall preview for the promotion at 8:30 PM EST/7:30 PM CST and Spike TV will air the preliminary fights on their website tomorrow evening. Gee, I wonder where that relationship is going. How is it that a guy with so many wins doesn’t have a Wikipedia page? The Luis Santos fan club really needs to get on this. Then again, Santos has mostly fought in Brazil and lacks impressive wins. Hornbuckle is going to come out pissed off, since I think he got jobbed in his fight with Brent Weedman in the quarterfinals of the season four tournament. Give me Hornbuckle by KO. Ben Saunders is tough and Chris Cisneros is a late replacement. I expect Ben Saunders to break Cisneros into hundreds of tiny pieces in what should be a not very close fight. Weedman proved last year that he’s a tough fighter. Chris Lozano hasn’t proved much with his best win over Yushiyuki Yoshida in the year 2010. I like Weedman to grind out a decision here and advance to his second consecutive welterweight semifinal. Lima is most recently the MFC Welterweight Champion whose biggest win is over UFC veteran Terry Martin. Carl’s been out of action for a while due to injury which caused him to miss the fourth season welterweight tournament. Lima does have some bigger wins and has been fairly active lately so I think we could see him pull off a submission win.